The introit will be the Easter introit, “He is Exalted,” but without the trumpet accompaniment. The first hymn, no. 469, is one made famous by the Muslim pop/folk singer Yusuf Islam in 1971. 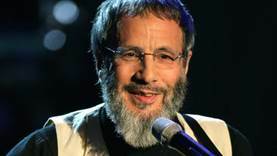 Although he has been known as Yusuf Islam since 1978, in 1971, he went by the name Cat Stevens. The tune BUNESSAN is named for a village on a peninsula of the island of Mull off the west coast of Scotland. The tune was first used for the carol, “Child in a Manger,” written in Gaelic by Mary MacDonald (1789-1872). When the words were translated into English by Lachlan Macbean (1853-1931), he gave the name BUNESSAN to the tune. BUNESSAN was first published in 1888 in Songs and Hymns of the Gael. 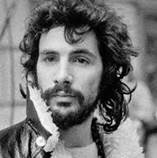 In 1979, [Cat Stevens/Yusuf Islam] . . . left his music career to devote himself to educational and philanthropic causes in the Muslim community. He has received several awards for his work in promoting peace in the world. . . . The reading from Acts, which substitutes for a reading from the Old Testament during Eastertide, is Acts 2:14,36-41. It includes Acts 2:40: “Save yourselves from this perverse generation.” (Some translations have “corrupt” or “crooked” instead of “perverse.”) The reading is about how the crowd responds to Peter’s exhortation, “Repent, and each one of you be baptized in the name of Jesus Christ for the forgiveness of your sins, and you will receive the gift of the Holy Spirit.” Peter tells them that the promise of the Holy Spirit is for “as many as the Lord our God will call to himself.” So Peter must not have been a universalist. Although Jesus had sometimes drawn large crowds, few were baptized. Peter, with the aid of the Holy Spirit, is much more successful, and three thousand people are baptized in a single day. 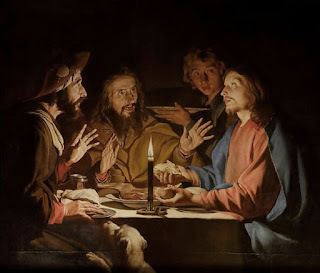 The gospel lesson is from the last chapter of Luke, Luke 24:13-35, the story about an encounter of two disciples (Cleopas and another who is not named) on the road to Emmaus. Though the second disciple is not named, all artists appear to have assumed the second disciple to be male, but there is nothing in the story to lead one to that conclusion. 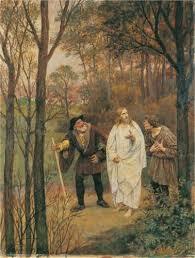 I was hoping to find a painting in which the second disciple was depicted as female. 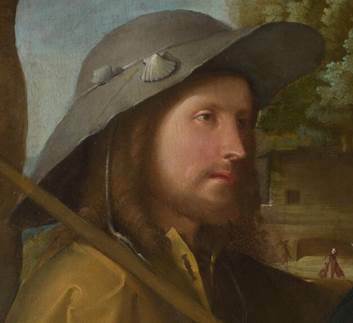 I didn’t find any, but in the painting below by Altobello Melone, the second disciple is, at least, shown as a long-haired young man with a pink cape who has a wispy beard and small feet. 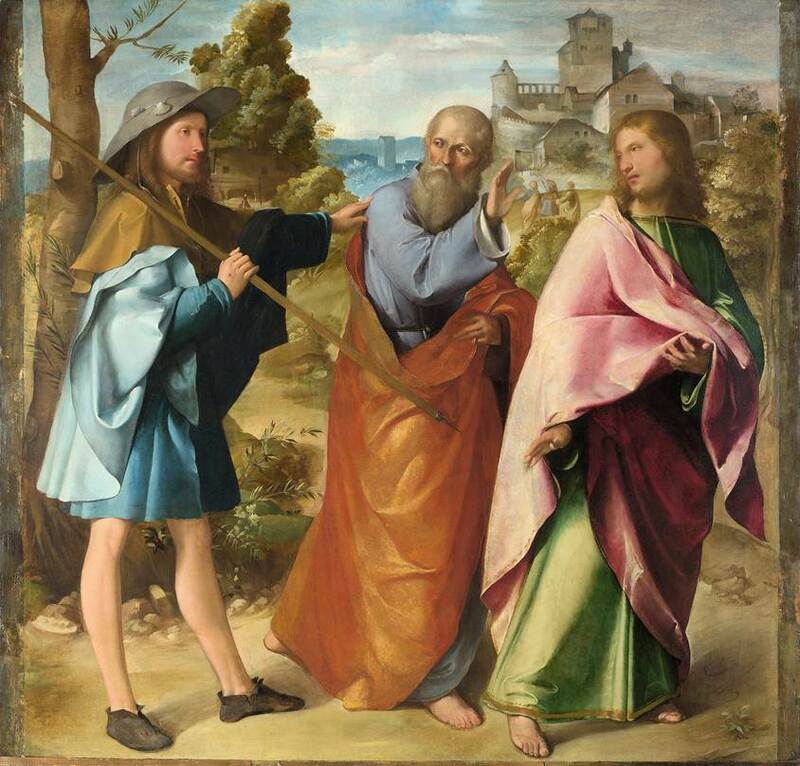 Altobello Melone’s painting The Road to Emmaus (~1516-17) of two disciples being startled by the appearance of a stranger. With his silly hat as a disguise, and a dangerously-pointed walking stick (which he flings about carelessly as a distraction), and a weird costume (that causes the disciples to avert their gaze and only look upon him askance), Jesus is able to join the disciples without being recognized. 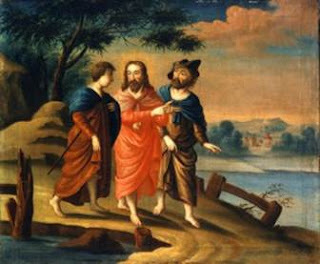 Here are other paintings of the two disciples being joined by another traveler, but not realizing that traveler is Jesus. 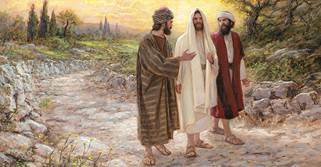 While at supper in Emmaus, Jesus breaks the bread, and the two disciples finally realize that the stranger who joined them is actually Jesus. 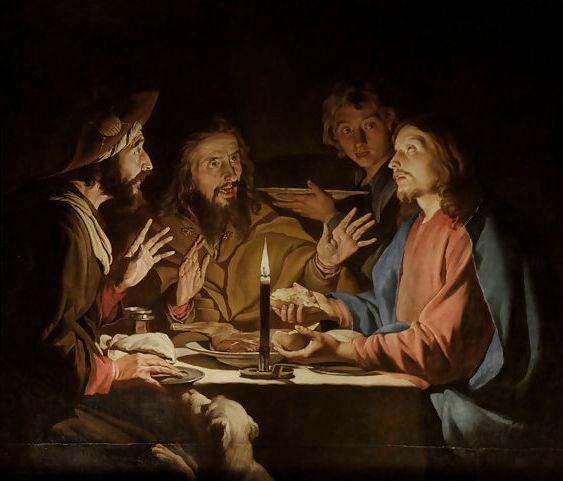 The artist was "especially noted for his depiction of artificially lit scenes." as he did it that gave him away? Mark 16:12-13. 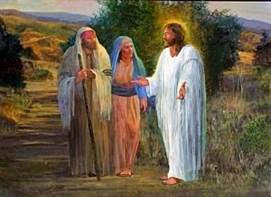 Afterward Jesus appeared in a different form to two of them while they were walking in the country. These returned and reported it to the rest; but they did not believe them either. It is an African-American spiritual. The tune is called SOJOURNER. The composer’s name is unknown. https://youtu.be/7qR9Bj2L0U0 Organ improvisation on “I Want Jesus to Walk with Me,” played by Noah Freeman (in his white socks) on the Trillium organ, Trinity Lutheran Church, Bend, Oregon. Alex Boyé is a British-American singer born in London on 16 Aug 1970 to Nigerian parents. He never knew his father, who remained in Nigeria. His mother told him one day she was going to Nigeria for a couple of weeks and did not return for eight years. He was raised mostly in foster homes. He started working at a London McDonald’s at age 16, where the manager was a member of The Church of Jesus Christ of Latter-Day Saints, which Alex then joined. (For a time, he was a backing dancer for George Michael.) He moved to Salt Lake City in 2000. He joined the Mormon Tabernacle Choir in 2006 and became one of its three black choir members. Hymn no. 311, “We Meet You, O Christ, In Many a Guise (Your image we see, in simple—and wise)” is the closing hymn. The words were authored by Fred Kaan in 1966. The tune is a Basque carol called NORMANDY. This hymn is more often set to STANLEY BEACH, DURHAM 72, or SHERSTON. He produced many arrangements of standard works for chorus, organ, and piano, and also composed original pieces. He did arrangements of “Smoke Gets In Your Eyes” (music: Jerome Kerns, words: Otto Harbach), “Bali Ha’i” (music: Richard Rogers, words: Oscar Hammerstein II), “Summertime” (SATB) (George Gershwin and Du Bose Heyward), “easy-to-play piano arrangements” of the songs of Cole Porter’s “Kiss Me Kate,” and also a collection of arrangements of “cowboy songs,” along with arrangements of the songs of many other popular musicals (“Oklahoma,” “West Side Story,” etc.). Jean-Pierre Marty, in Perspectives on Mozart Performance (Cambridge University Press, 2006)says that “tempo” in Mozart’s time had a broader meaning than it has today.
. . . it is certain that they [Haydn and Mozart] shared a common idea of tempo, an idea that transcended the mere question of speed. The invention of the metronome at the beginning of the nineteenth century represented a distinct setback for both the comprehension and the expression of tempo, which was now reduced to its purely quantitative element. This reduction had two major consequences: eighteenth-century tempo indications ceased to be understood; and metre lost its central role in the expression of tempo, so that composers were deprived of an essential element for conveying the expression of their musical message. I’m not sure which one of Mozart’s compositions (that has a tempo marking of “Lento”) will be the music performed. Mozart’s “Marche Funèbre del Signor Maestro Contrapunto” (1784) is one such piece. Mozart intended the piece as a joke (as you can tell by the name of the piece, “Signor Maestro Contrapunto” indeed). It is a parody of the first movement of his Concerto in D Major (K. 451). The similar theme is played Lento instead of Allegro as it is in the concerto.